Hello, my friends! 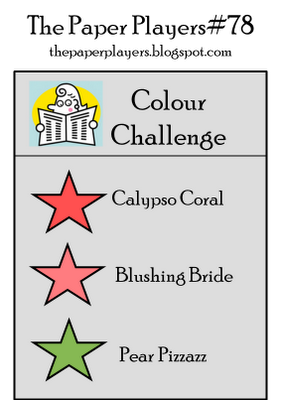 Today I'm playing along with LeAnne's colour combo at the Paper Players and also linking up to Unity's Friends With Flair blog hop. If you look closely at the centre of the flower you can see that it's paper pieced with Blushing Bride paper and then I punched 1/16" holes from the Pear Pizzazz paper for the dots. They were certainly a bit fiddley to stick down but I got them in place eventually. What a super cute card!! Wow those tiny dots must have been so fiddly to deal with...bravo for your perseverance:) Love the bold image and colours even if you did miss the deadline!! Love your card, that flower is just too cute. Plans for this weekend include lots of time in my jammies spent in my craftroom. Very cute. How patient you are to mess with those dots. You are rockin' the CAS! Fabulous card! Hi Jen! Love this card!! It looks totally professional, Great CAS design!! This is CAS perfection!!! Love everything about it!!! Your paper piecing is incredible! That would try my patience! I love it! off to see Billy Elliot tomorrow night! Looking forward to it! Hope you get to sneak away to the craft room! This is really,really cute! Very CAS. LOVE! Fantastic CAS card, love that little flower! So cute Jen and I can't believe you paper pieced all those little dots! oooo! I really like this. great CAS card, simple and pretty! Don't you just HATE missing deadlines!! 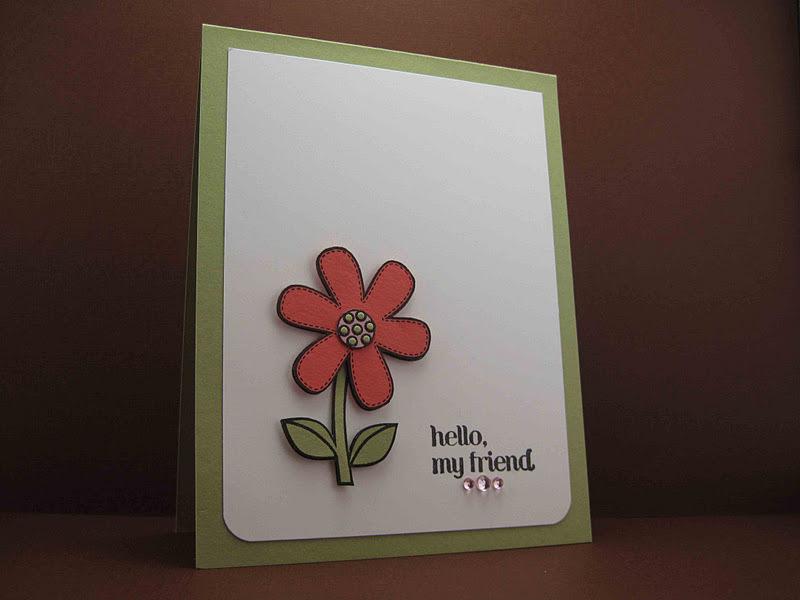 Especially with a card that had you fiddling with little dots for the center! But the dots were with it as you created such a jaunty and cheerful little flower! I love this adorable card! Those colors are amazing! Ugg, sorry you missed the deadline. I hate when that happens! I sure love the simplicity to this! The center is paper pieced? Whoa! (I had to click to believe!). Talk about a fab detail. I love this sweet card. Hey, I keep forgetting to tell you that I LOVED, LOVED, LOVED your cards in the Dec. CARDS! The house one was my favorite in the issue! Such a sweet card, Jen! Love your use of the white - I need to do that more often! Sorry you missed the deadline, but you are a winner in MY book for sure! A simple card with awesome details! Love the punched circle technique! This is gorgeous. I love your great CAS Design and fabulous work with those colours. How very precise of you to stick down all those dots so perfectly! What a perfectly sweet CAS card. holy moly, i need to get some of your dedication to perfection my dear! Oh gorgeous! My idea of a perfect card! THUD! Adore this super cute cas card. That flower is amazing.